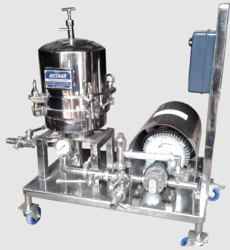 Pioneers in the industry, we offer pharmaceutical filter press, industrial filter press, honey filter press, syrup liquid filter press, carbon slurry filter press and automatic sugar syrup liquid filter press from India. 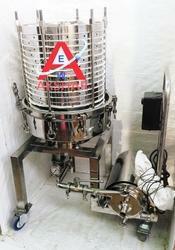 We are instrumental in manufacturing, supplying, trading and exporting high quality Sparkler Filter Press. The offered spectrum is used to filter the impure liquid. Arriving on top of each horizontal plate with increasing pressure, the filter media holds back the impurities and allows the filter to pass through centre by interlocking cups, which takes the filtrate to the outlet of the filter. Moreover, the function of filtration process becomes slow when the liquid reaches its holding capacity into the cake. .
Dia. 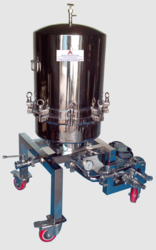 of Plate 8" 14" 18" 24" 33"
Our clients can avail from us a superior quality assortment of Industrial Filter Press. Our offered range of products is manufactured at our state-of-the-art infrastructure facility employing advanced technology. Post-production, these products are thoroughly inspected by quality controllers on certain well-defined parameters of quality in order to rule out every possibility of defect. 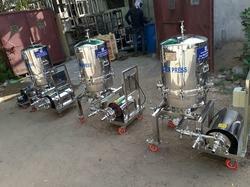 We hold the expertise to manufacture, supply, trade and export high quality Honey Filter Press Filtration Machine. 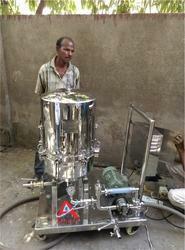 A trained and qualified team of professionals is hired by us to manufacture the offered range of filtration machines. Post production, we thoroughly inspect these machines on certain well-defined parameters of quality to rule out every possibility of defect. 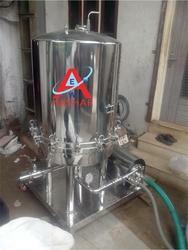 We hold expertise in offering a superior quality range of Syrup Liquid Filter Press. The range of presses we offer is extensively used in various applications such as in filtration of syrups. Our logistics personnel make sure that the consignments are timely delivered at customers’ destinations using easy shipment modes. We specialize in manufacturing, supplying, trading and exporting a qualitative array of Honey Milk Acidic Liquid Filter Press. These presses are designed and manufactured keeping in mind the variegated requirements of our respectable customers; using best-in-class material. Besides, we pack these presses in premium quality packaging material to ensure their safe transit. 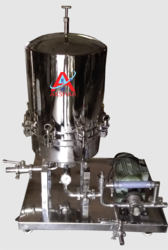 AKSHAR ENGINEERING WORKS range of Filter Press is used for wide range of applications by several industries like Pharma, bulk drugs, distilleries, beverages & other industries.There are various combinations available in size & number of plates to give different filtration area 8 cake holding capacities to meet your process requirements. The work man ship, finish & make of components ensure best quality to meet the industries requirements. The Cartridge assembly consists of plates, perforated screens, spacers and fitter media. Interlocking spacers internally form single pipeline. The unfiltered liquid is centrally fed under pressure from bottom inlet. The liquids spreads out equally on each plate fitted with filter media. Solids remain on filter media and clear. filtrate flows through precisely made holes on sides of plates and collects in the shell, which then comes out through the outlet. In this process, solids are evenly distributed on each plate. The cake is then cleaned from the filter material and used again for filtration process. SIZE: 8", 14", 18", 24", 33"
The main operation of sparkler filter press is to filter the impure liquid. Arriving on top of each horizontal plate with increasing pressure, the filter media holds back the impurities and allows the filter to pass through centre by interlocking cups, which takes the filtrate to the outlet of the filter. The cake formed between the horizontal plates can also be obtained. The function of filtration process becomes slow when the liquid reached its holding capacity into the cake. 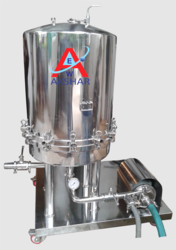 The Akshar Engineering Works offer a wide range of paint filter press in India consisting of stainless steel shells with bolted top cover. This feature helps the filter press to create and maintain its pressure. Several disc type filter plates are arranged horizontally in the filter cartridge assembly with perforated supporting screens, filter media and interlocking cups. The whole assembly shell stands on S.S. trolley and structured with pump and piping connection. Looking for “Pharma Filter Press”?